The rent at Ansley At Town Center Apartments ranges from $996 for a one bedroom to a $1,431 three bedroom. Apartments in this building are about 9% more expensive than the Martinez average. This is a pet-friendly apartment. This apartment is in Martinez. Nearby parks include Evans Towne Center Dog park and Evans Towne Center Park. 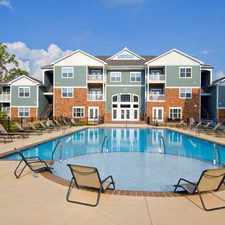 Ansley At Town Center Apartments has a Walk Score of 38 out of 100. This location is a Car-Dependent neighborhood so most errands require a car. Ansley at Town Center sets itself apart by offering modern, garden-style and townhome apartment homes in the heart of Evans. Our spacious one, two, and three-bedroom floorplans include luxury amenities including hardwood style flooring, glass tile backsplashes, granite countertops, new cabinetry with under lighting packages. Our top notch community amenities include picnic and BBQ grills, detached garages, and salt water pool.\n\nWith all the best Evans has to offer, our neighborhood is home to the Georgia Regents University, Club Car Manufacturing and minutes away from countless restaurants, shopping boutiques, and community attractions. Contact us today to see how you can call Ansley at Town Center home today! Explore how far you can travel by car, bus, bike and foot from Ansley At Town Center Apartments. Ansley At Town Center Apartments is in the city of Martinez, GA. Martinez has an average Walk Score of 19 and has 35,795 residents.